Summit Terragraphics is a small creative map-making company specializing in attractive accurate raised-relief wall maps. 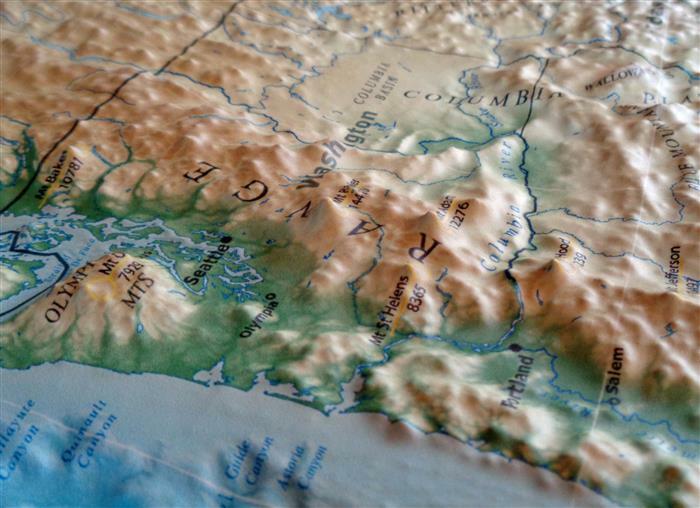 Over the past decade, custom 3D relief maps have become our core business, with maps of all sizes designed and produced to meet the unique mapping needs of business and government organizations. 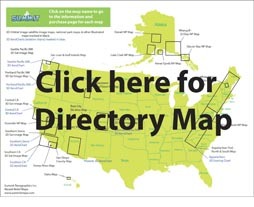 Our experience includes creating custom maps for clients such as the National Park Service, the US Military, AVAs and wineries, utility companies, resorts, visitor centers, and occasionally for private landowners. At the same time, we offer a growing selection of existing maps to the public -- hikers, climbers, pilots, and other outdoor enthusiasts -- through our online store. Learn more about Summit custom mapping capabilities. Explore our existing map products. We can customize Summit's 42" x 30" 3D US Mainland map to include your custom graphics: transportation/supply routes, coverage areas or territories, corporate locations, your logo -- whatever you want to include. In most cases, we can add your custom graphic layer for between a $300 and $1,000. Then copies of your unique map are available for under $100 each (unmounted). We offer our maps either unframed (poster-style) or mounted and fully framed. 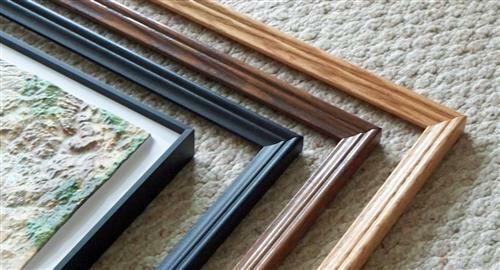 Framing options, from left to right in the photo, include black anodized aluminum, black-painted poplar wood, dark-stained solid oak, and golden-stained solid oak. Framed maps make great gifts and arrive ready to hang, with hanging hardware, picture wire, and corner bumpers in place. Please note that for our US Mainland, Kauai, Washington state, and Alaska state maps, the only frame offered is black aluminum.